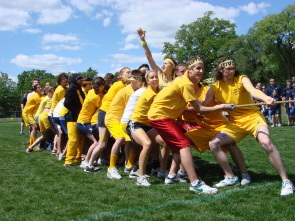 The final score for the 115th Color Day on May 23, 2008, was: Blue 24 - Yellow 13. The record books dating back to 1893 show the tally for this friendly competition: Yellow 60 - Blue 53 - and 5 ties. This image was graciously provided by The William Penn Charter School.